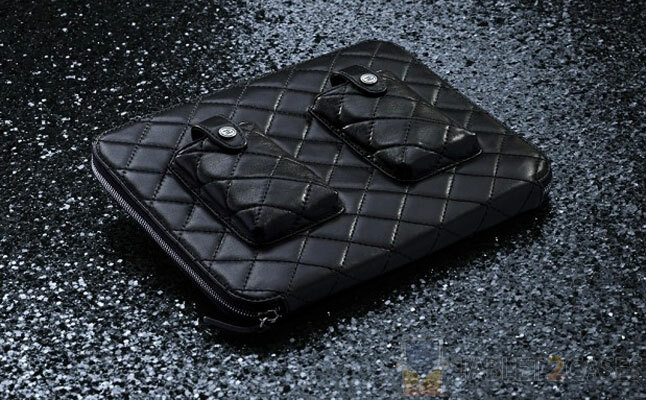 Chanel iPad Holder is an extremely stylish tablet designer case made from highest quality lambskin leather . The new case has already been spotted carried by Karl Lagerfeld, the creative director for the Chanel designer house. Now, the new Apple iPad case was announced to the wider public. The new folio tablet case sports Chanel’s signature quilted lambskin exterior, which is thick enough to guard the device from minor bumps and bruises. The high quality zippered closure ensures the case stays closed when not in use keeping the Apple iPad inside at all times and preventing accidental slip outs. The iPad Holder also features two exterior pockets, which comfortably fit your cell phone or a number of other useful things you might need during your busy day. The price is yet unavailable, but expect it to be worthy of a great luxury tablet case .